As a cost-saving measure, all listings I market will have to be priced at $360,000. This is our first attempt at doing custom yard signs. Some developments won’t allow post signs, others require their own, neighborhood-approved signs in accordance with their homeowners associations’ regulations … some neighborhoods don’t allow signs at all. One size does not fit all, and this is but one way that we are seeking to re-define how real estate is done in Charlottesville and Central Virginia. We want to market our clients’ homes, not our brokerage. The early feedback has been promising. But … do they work? Here’s the really interesting part. After hanging the sign I started to pull away and had to stop and get my camera out again. Three cars in a row stopped to look at the sign and one actually sent their child out to get the flyer. So: within minutes of hanging the sign I had eyeballs from three cars and conversion on one; you have got to love that kind of impact! BTW, the first thing my clients said was they loved the sign. 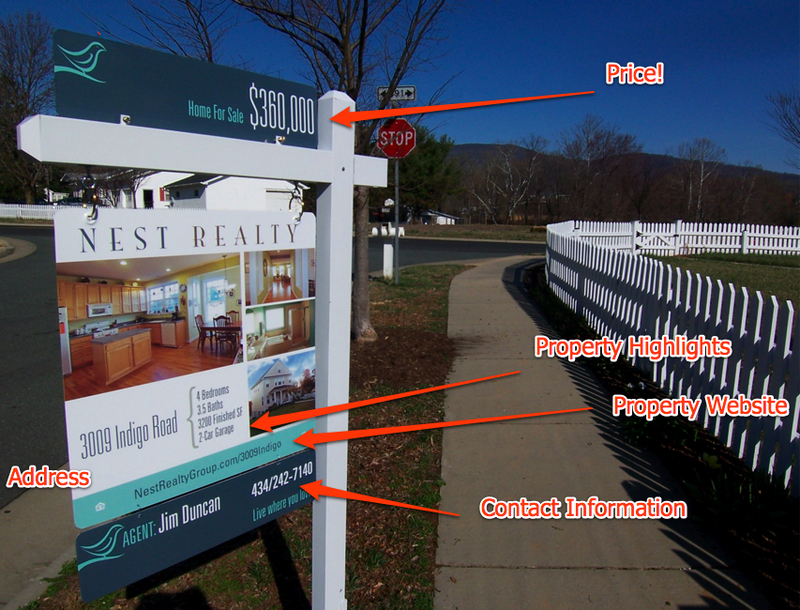 I remarked how standard signs only tell people a house is for sale while marketing for the brokerage. One of the ideas behind a custom sign is to encourage people to stop the car and get out to read the sign (thus increasing the possibility of interest). Saturday and Sunday I held an open house and the feedback I received from the nine to ten sets of people who came through was universally positive. Positive feedback is good – constructive feedback is better. Update 23 March 2009: NBC 29 did a nice story about the signs. – Describing John Kalinowski’s signs in Northeast Ohio. Approximately how much is it to produce a custom sign like this? Curious to see if price will be a deterrent for wide-spread adoption. Thanks for the great post! Nice sign, Jim! You’re bringing a novel approach to real estate – actually sharing price! I think your signs will certainly help you to stand out in your market. It amazes me that at least half the homes I see listed don’t have a price on the flyers posted at the property. Do the agents using this stupid tactic really think that they can somehow sell someone better if they force a potential buyer to call in? Really great marketing, Jim. Best yard sign I’ve seen. I’m heartened to see that your getting results from giving information rather than withholding it for a phone call. Kudos. Did you have the sign posts already to re-use? Or did you purchase with the sign? Sign posts are reusable … still deciding what to do with the signs, though we have a couple great ideas …. This is better in so many ways than a standard sign but I’m curious to hear your ideas on what to do with the signs afterwards. The only down side to me seems to be that they’re not readily reusable. Excellent design. So many RE signs are hampered by the dual role of promoting the product and the agency. Your sign clearly promotes the product and as a result people are going to be curious to know more about who uses such sensible signs. Price saving measure…made me laugh. How do you accommodate price reductions? Why not say “$360s” or whatever for flexibility. Love the signs! Seems you and I are on the same page with the way signs should be like. The property comes first – the brokerage firm and my information is secondary. I redesigned mine a few months ago to feature 5 to 7 key points about the property and the property-specific web site url. It’s been a hit with sellers and those seeing the sign. But I have to admit…your sign is much better looking than mine. Mind if I borrow some ideas from your sign for use up here in NoVA?